Bharat Sanchar Nigam Ltd. (BSNL) will recruit about 198 numbers of Graduate Engineers to the Post of JTO (Civil) & JTO (Electrical) under SRD for SC, ST & OBC from open market/external candidates through GATE SCORE-2019. Wide publicity in this regard was given through the indicative advertisement by all the Telecom Circles on 10-09-2018. As such interested candidates shall have to appear in GATE-2019 and also need to get their candidature registered in BSNL for the post of JTO (Civil) & JTO (Electrical). BSNL shall not conduct any further examination or interview in this regard. The detailed number of vacancies in the grade of Graduate Engineers to the Post of JTO(Civil) & JTO(Electrical), are detailed in Annexure-A. All the willing candidates must have a GATE Registration ID (13 digits) for applying for DR-JTO(Civil) & DR- JTO(Electrical) online Registration. The BSNL comprises a number of territorial Circles and functional Circles. A list of the existing Territorial Circles along with the Vacancy Details., appears in Annexure-A. The JTO (Civil) & JTO (Electrical) is a Circle-based Cadre and the candidates would be selected against the vacancies of a particular Circle. (The candidates are required to serve in that particular Circle until they are promoted to All India Cadre). However, BSNL has the right to post any selected JTO (Civil) & JTO (Electrical) to any of the Circles either temporarily or on permanent basis in the interest of service. The decision of BSNL in this regard will be final and binding. The service conditions, seniority etc. of selected candidates will be determined as per prevailing rules of the Company from time to time. First of all, the interested candidates must possess the educational qualification BE/BTech. or equivalent in Civil Engineering for JTO(Civil) & in Electrical Engineering for JTO(Electrical) from a recognized Institution/University AND are required to appear in GATE exam 2019, opting one paper from selected two disciplines of GATE paper codes i.e. Electrical(EE) & Civil(CE) (details are available at www.gate.iitm.ac.in). Secondly, the interested candidates shall have to register themselves further with GATE Registration ID (13 digits) with GATE paper codes i.e. Electrical (EE) & Civil (CE) through www.bsnl.co.in. 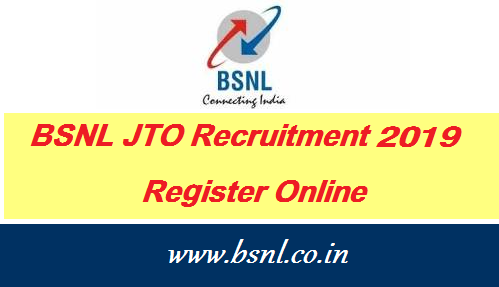 This application/registration is required towards the candidature for the post of JTO (Civil) & JTO (Electrical) in BSNL through GATE 2019 Score. Candidates applying for JTO(Civil) & JTO(Electrical) posts are required to apply online for which link shall be provided through BSNL web site www.bsnl.co.in. The applications will be considered only through the online registration process which is to commence from 11-02-2019 and will be closed on 12-03-2019. Therefore, candidates are advised to visit our web site (www.bsnl.co.in) for any updates regarding recruitment. All candidates applying for JTO (Civil) & JTO (Electrical) posts are required to read all the instructions provided on website www.bsnl.co.in before filling the online application form. The amount of the fee shall not be accepted in any other form. Fee once paid shall NOT be refunded under any circumstances nor can be held in reserve for any other examination or selection or otherwise. BSNL shall not be responsible for multiple registrations by any candidate. In case of multiple registration, the candidature of the candidate will be cancelled for all the registrations.